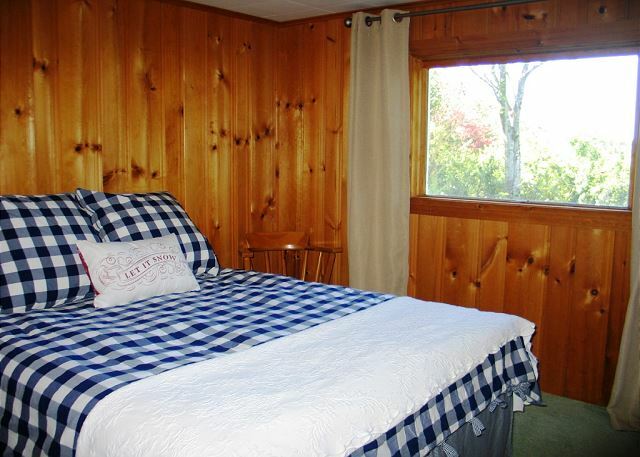 The SkyView Chalet is a 4 bedroom, 2 bath chalet located in the quaint Mittersill Village. 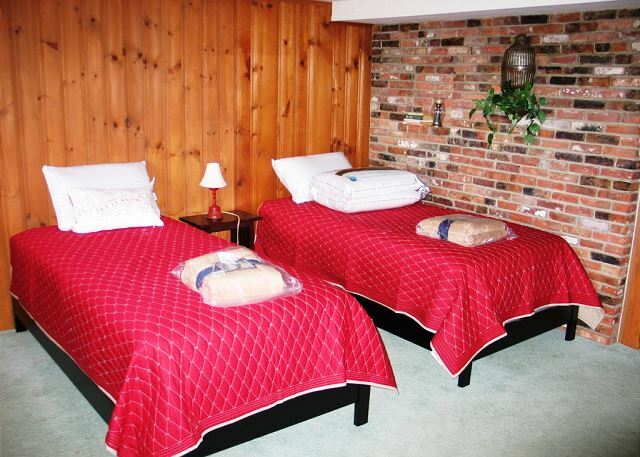 Recently redone, you're sure to enjoy your home away from home here in the White Mountains! Step into your chalet from the parking pad most immediate to it, and BAM... the view is yours! Clear on up to Canada on a blue sky day. And here's that blue sky day! 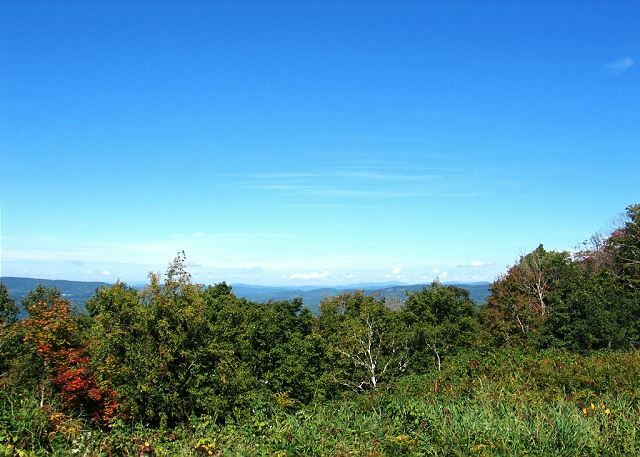 Perfectly perched atop the edge of Mittersill Village, giving some of the most spectacular views in the area. From the driveway, look up towards Cannon Mountain and you've got a great view of the newly cleared ski trail! 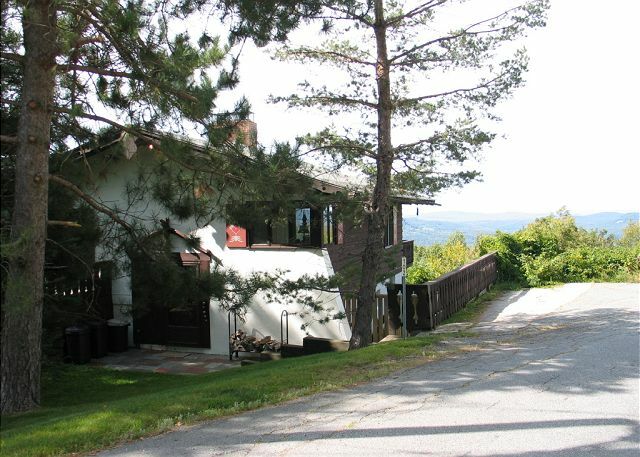 For the skiing enthusiast, this professionally managed chalet is as close you can get to Cannon Mountain (less than a mile) and less than a 30 minute drive to Bretton Woods and Loon Mountain. Make your reservation today to take full advantage of this incredible location. 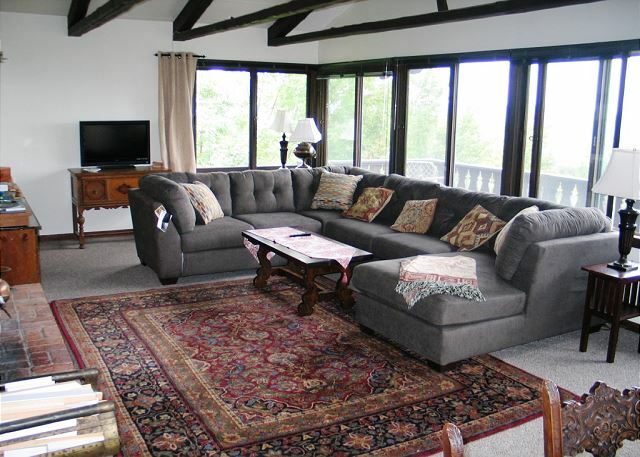 You're sure to enjoy this newly renovated and partly refurnished Mittersill Chalet's living area. While lounging on the new enormous sectional sofa, you won't know whether to take in the crackling fire, a TV event, or the sweeping views! 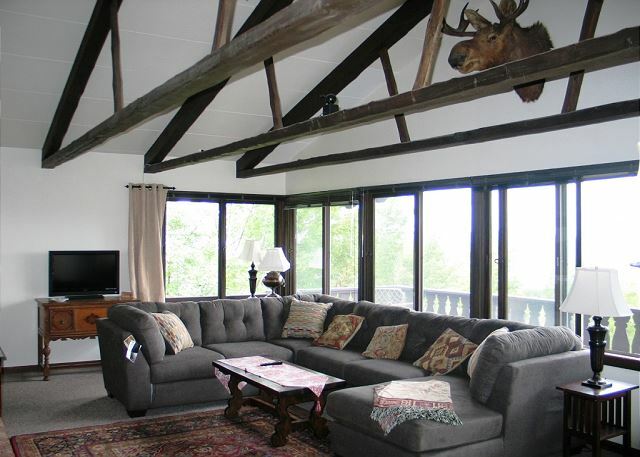 Complete with beamed ceilings, wrap around windows, and moose mount. Warm up in front of SkyView Chalet's huge fireplace, one of the grandest in the Village, after a long day on the slopes. There are also family games to entertain everyone in your group. Looking from the living area toward the dining room table. You'll see that the windows continue on the other side of the home, expanding that great view even further. The dining room table looking towards the kitchen, with the stairs to the lower level to the right. Although separated, meals will have an easy transition from kitchen to table top. 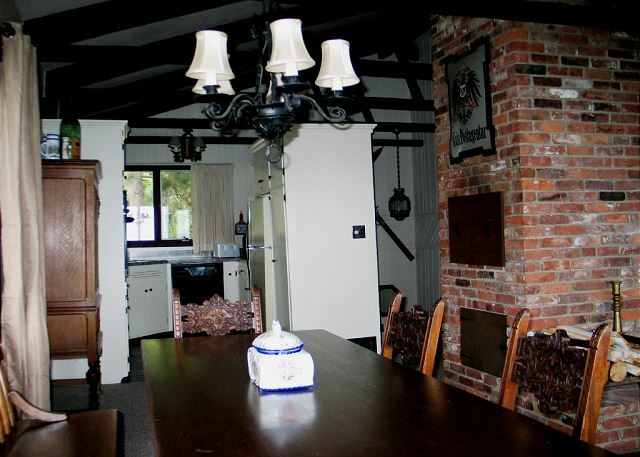 The dining area, looking from the kitchen. 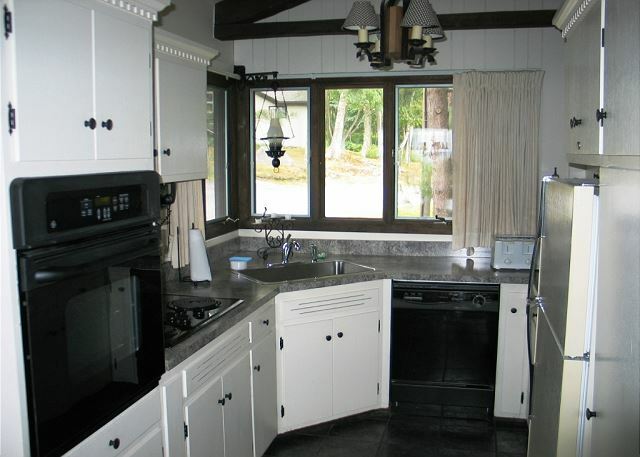 The fully equipped, crisply white, and clean kitchen features a wall mount oven, dishwasher, and ample cupboard space. 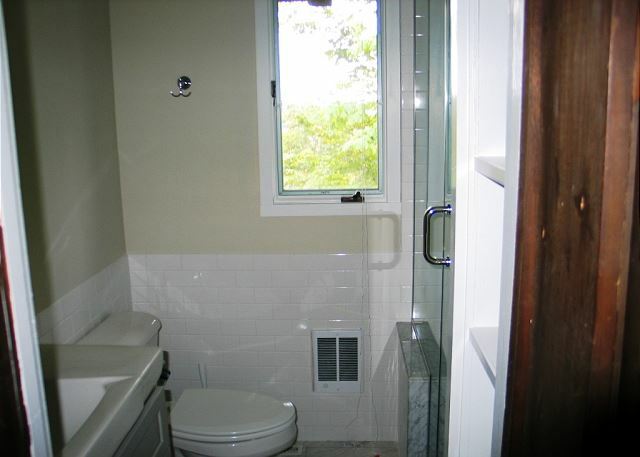 The main floor bathroom with new walk in tiled shower. Bedroom #1 Master with queen bed, private doors to the deck, and immediate access to the main floor bathroom. 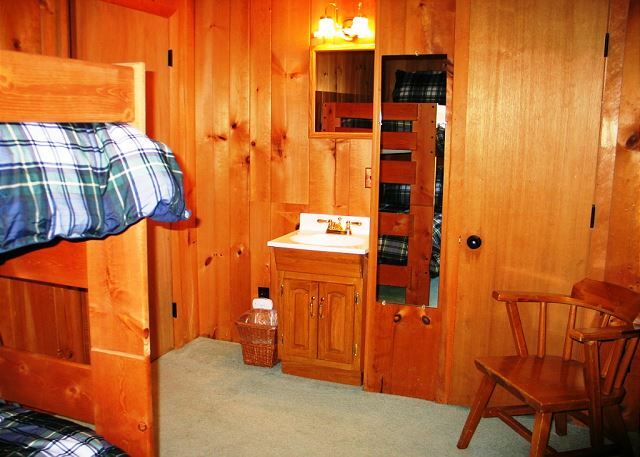 Bedroom #3 also includes a convenient vanity, and houses the stacked washer and dryer in the closet. 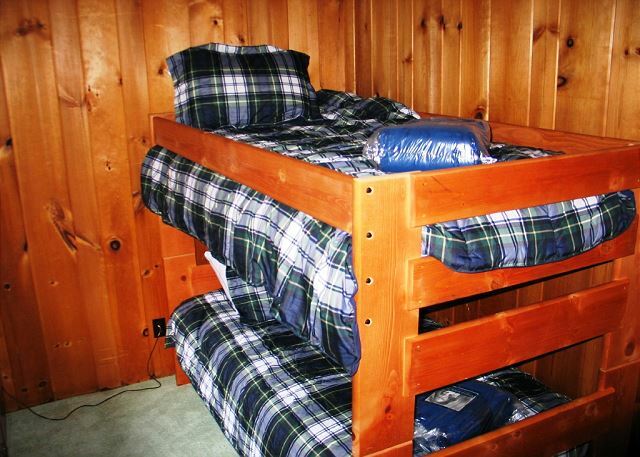 Bedroom #4 with 2 individual twin beds, as well as an additional twin trundle day bed. The second view of Bedroom #4 - not shown to the left is the private entry from outdoors. All bedrooms on the lower level share a 3/4 bath. 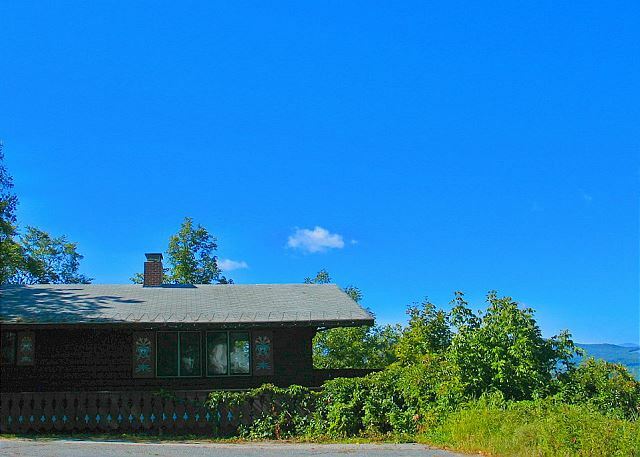 Mittersill Village's SkyView Chalet, fully renovated during Summer 2015, has satisfied many generations of guests and is now ready do to so for the years to come. Professionally managed and fully prepared for each guests arrival, this chalet offers a modern vacation rental feel & function while maintaining its old world Austrian Chalet styled comforts & charms. 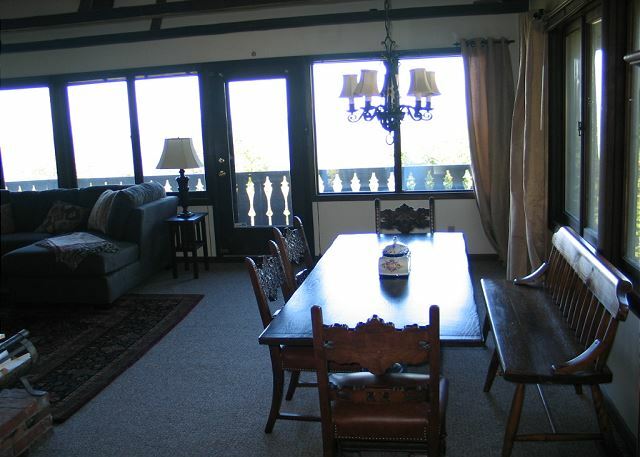 With 4 bedrooms and 2 baths, sleeping up to 8 guests easily, this alpine chalet is perfect. 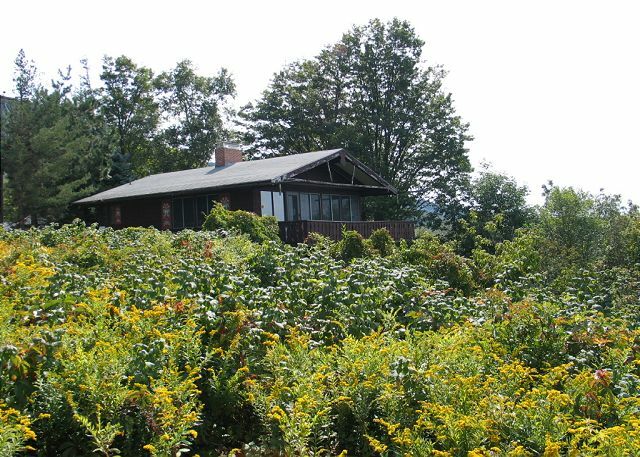 Best of all, is the location, less than a mile from all that Cannon Mountain Ski Area & Franconia Notch State Park have to offer, such as 2100 vertical feet of skiing in Winter, or spending hours of enjoyment on Echo Lake in Summer. And then, wow, this chalet enjoys Grand Views directly from most every window. Call to make your plans today! After four decades of renting a dozen Mittersill chalets, my family considers this one to have the best view, due to the panoramic windows and balcony! We would have felt even better if the stairs from the driveway had a handrail and if the outside floodlights (and more of the inside lights) had worked and if the living room blind on the carpet had been in place with all other blinds. Those concerns aside, we greatly enjoyed our first stay in this lovely home. Thank you, Cort, for letting us revise the contract to include two extra days. We hope to gaze at sunsets and stars from this chalet for years to come! So glad "to see" where you all have found our best view in the houses of Mittersill, all while noting that it has been a busy summer season here this year. We'll be sure to get all the bulbs & blinds that need be replaced & repairs as necessary and will pass along the constructive input pertaining to the stairs to the owner for future consideration. Speaking of future... This a very popular stop so if ever planning for a repeat visit, it is always best to make plans early before anyone else scoops the spot as this sunset view is UNmatched otherwise. Thanks always for the many, many years of being our guests!!! Sincerely, Cort Roussel Owner-Broker, Franconia Notch Vacations. 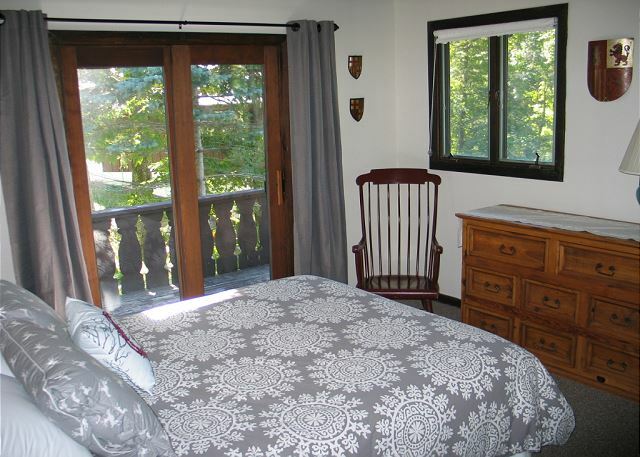 The SkyView Chalet worked very well for us this past ski season. The Living/ Dining Room is large and comfortable which made entertaining easy and the view from the Living Area is hard to beat! 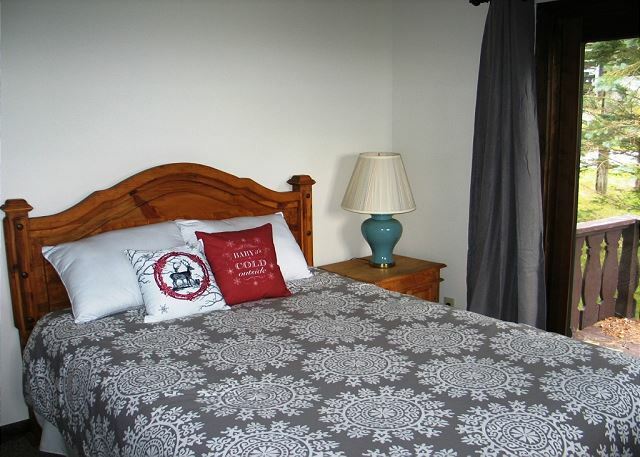 Furniture & Decor is appropriate for a ski house and bedding is better than any other seasonal rental so far. 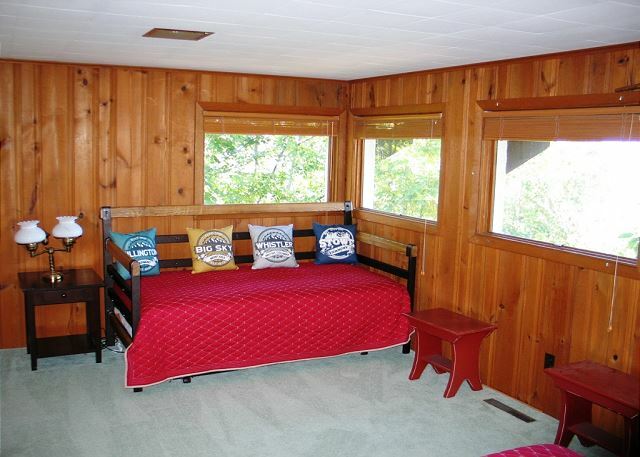 The location of the lower level Mudroom/ Ski Room is a bit strange because it is accessed through one of the lower level bedrooms, but it is a room with several twin beds for kids so privacy was not often a problem. Fantastic sunsets! SkyView lives up to its name! 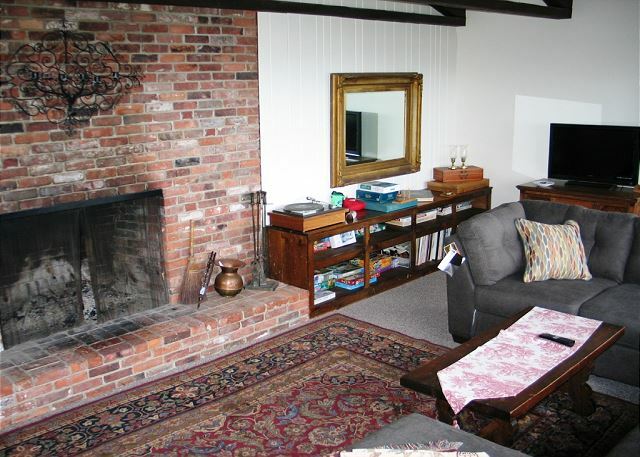 The property was well maintained and comfortable, and clean. The views were magnificent. Would stay here again. Highly recommend. Great experience with the family. Stayed during 4th of July weekend. Property had a perfect view. You could see out for miles just from the dining room table. I would definitely return with the family. Especially during the winter season. The owner of Franconia Notch Vacation was extremely helpful. My family and I planned this trip last minute and he assisted with finding a nice place for us at a reasonable price. Well run organization. We would consider this service for future family trips.